I'm afraid that Le Verrier's Planet, as it was originally called, is rather dull both etymologically and poetically. Most poetry had been written by the time that Le Verrier spotted it in 1846. There is no astrology. No associated metal or character trait. There is an element called Neptunium, but it's not very interesting. 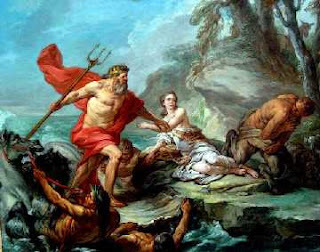 There is a theory called Neptunism that suggests that rocks were formed out of the waters of the ocean, which is a pretty idea, but like most pretty things is wrong. Instead, I shall merely echo Virginia Woolf* in observing that there are some words that should never be used again. Shakespeare's incarnadine, Wodehouse's gruntled and H.P. Lovecraft's gibbous. Incarnadine is, of course, a verb meaning to make bloody. 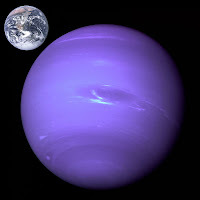 The only faintly interesting thing about Neptune is that because it's a modern name it is nearly universal. Even the Chinese call the planet "Water King Star". *N.B. The Inky Fool does not endorse the works of Virginia Woolf and can accept no responsibility for those who perish from tedium while trying to read To The Lighthouse.